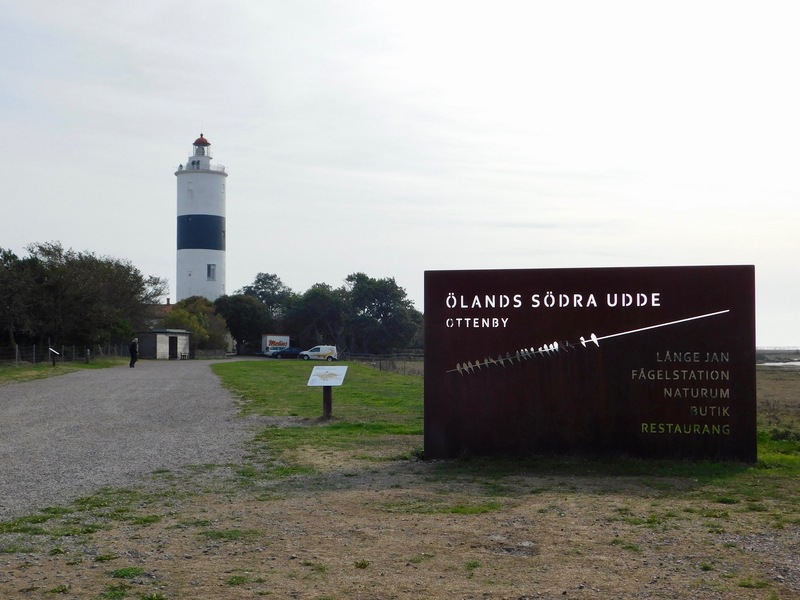 Our aim for today was to visit Öland, Sweden's second-largest island. Howard had scoped out a potential coffee stop on the way at Kalmar Airport. When we arrived, I was thrilled to find a Saab Draken fighter on a pole outside, a testament to the airport's past as a military base. The island is very flat, and must be bleak in winter, but now, with fields the soft colours of early autumn, the sea away to one side, and a landscape dotted with sheep, cows and little red windmills, it was pretty. 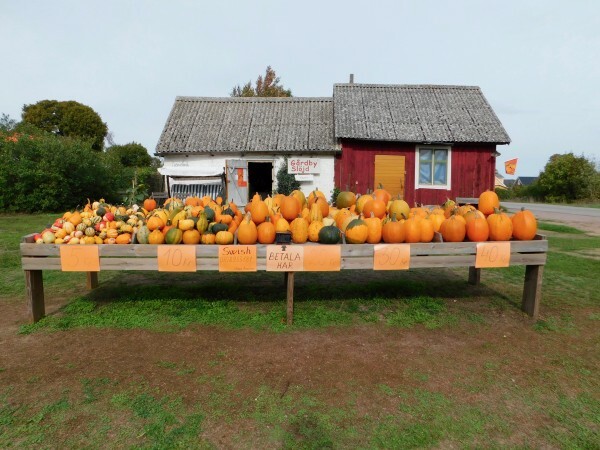 You could buy pumpkins - pumpor - from wagons and stalls at the side of the road, leaving your money in an honesty box. I bought a tiny gourd for 5Kr (about 50p) and brought it back to the UK. It's in the airing-cupboard, where I hope it is drying out. It was the end of the season, and all the cafés and restaurants seemed to be closed. Eventually we reached the southern tip of the island, a nature reserve with a lighthouse, a birdwatching station and, most importantly, an open restaurant. I had 'sillmacka': fish and new potato on a sweetish, crumbly brown roll, with sour cream and finely-chopped onions. Returning, we realised we'd gone round the island the wrong way, as shops and café were considerably more open. Two pale, velvety deer shot across the road in front of our bikes, and we stopped to watch them bound away across the fields. Back at camp, I sought out Haider and requested to use the sauna, which we'd been told we could do by arrangement. "Sure," he said, delightedly, and led me off to inspect the facilities: "Here is wood, here is axe." He explained that the light bulb had gone, "so you must twinkle with your eyes," and patted my shoulder in the way that harmless old men are allowed to pat women on the shoulder. Howard showed me how to split the logs and we built a fire in the stove. An hour later, we were sitting in the warm scent of woodsmoke, watching the thermometer rise as the sun set outside. Haider had suggested a swim in the lake after the sauna. I wasn't sure how serious he was, but I went for it anyway, ploughing through cold, black water filled with duckweed and possibly pike to touch the wing of the aeroplane before swimming back towards Howard and the lantern he was holding aloft to guide me in. On my return, Howard informed me that I had disappeared into the dark almost immediately and he'd been worried he'd be going home alone. I had a shower, then we retired to the kitchen to eat tinned ravioli with IKEA cutlery. I had 'sillmacka': fish and new potato on a sweetish, crumbly brown roll, with sour cream and finely-chopped onions. That sounds lovely — and very Swedish! "And here is plan for constructing sauna." I was glad to discover the open sandwich is a real thing and not a lie peddled to us by IKEA! Ha! I was worried about the amount of work needed to have a sauna, but we only required a couple of logs in the end.